This is the way I roast my chicken – with the vegetables around the bird. Chunks of parsnip, pumpkin, turnip and carrot and small onions are all good to add with the potato. An hour and a quarter before dinner, preheat oven to 220°C. Rub chicken vigorously inside and out with lemon. Crush garlic with the back of a knife, roll in salt and pepper and insert in cavity with lemon halves, rosemary sprig and butter. Put chicken into a large baking dish. Put vegetables into a bowl and season with salt and pepper. Add a few rosemary leaves and oil and toss to coat. Scatter vegetables around chicken and massage its skin with the seasoned olive oil. Turn chicken on its side. Reduce oven temperature to 160°C. Transfer chicken and vegetables to a heatproof plate and rest in oven. Discard all fat from baking dish and deglaze over heat with wine. Stir vigorously to dislodge all the cooked-on good bits, and lengthen with either a little more wine or add some home-made stock or tomato sauce or cream. Joint chicken, arrange on a serving platter with vegetables and pour over juices. short cut If you only have 45 minutes before dinner, cut the chicken in half down either side of the backbone using heavy scissors. (Reserve the backbone for stock.) Season and massage chicken as above. Put the garlic and lemon halves underneath the chicken in the baking dish. The vegetables will need to be cut smaller to cook in time (or forget roast vegetables and serve a salad and grilled eggplant or green beans). There will be no need to turn the chicken, although it should be basted with juices after the first 20 minutes. gravy If you believe that chicken must have gravy, stir 1 tablespoon plain flour into the baking dish before deglazing. Wait until the flour is a good brown colour before adding 1 cup deglazing liquid and stirring very vigorously with a wooden spoon to avoid lumps. As an alternative to plain flour, mix 2 teaspoons flour to a paste with 2 teaspoons Dijon mustard. roast chicken stock While you are clearing up, put the chicken carcass (together with neck, giblets and backbone, if reserved) in a saucepan with a sliced onion, carrot and bay leaf and barely cover with cold water. Add parsley stalks and celery if you have them. Simmer for an hour or so, then strain and chill overnight. The following day, pour the stock into ice-cream or ice-cube trays and freeze. 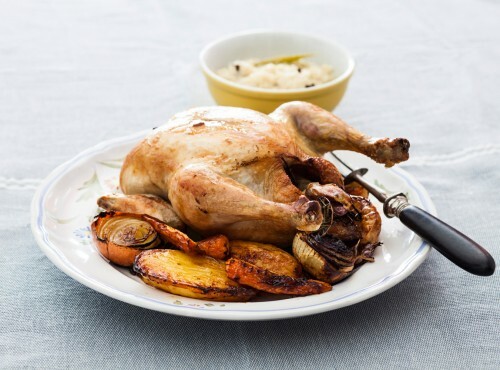 The next time you roast a chicken, you will have some light stock to add flavour to the juices.